On last week's episode of the PC Gamer Show, we talked about the rise and fall of the arena shooter. What was once one of the most beloved genres on the PC has waned in popularity in recent years, but might be on the rise again. You can watch our full discussion of arena shooters here, but I wanted to highlight a relatively new game that we didn't mention on the show. 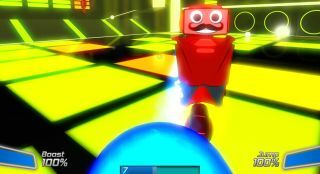 Robot Roller-Derby Disco Dodgeball came out early last month and is a fresh take on the classic arena shooter formula. Although it's an insta-gib game, timing your shots and waiting for the right moment to strike is very important and cuts out some of the twitch precision that frustrates me with other insta-gib games. It's by no means perfect, as I did encounter occasional lag issues, but its silly title and attitude can make it easy to overlook. Watch the video above for my first impressions of the game.